Save 10% on orders of $1,000. when you place your order by December 31, 2013! Just want to remind everyone before we all get too busy with the holidays about our special offer on preseason orders. We are offering a 10% discount on orders of $1,000. or more placed by December 31, 2013. This helps both of us – You save money (Who doesn’t like the sounds of that?) and you are assured of getting the varieties you want. Our bonus – we know what to plant so we won’t disappoint you (We don’t like the sounds of that). WIN / WIN! We like it. You can download the order form, fill it out and fax it to us at 360 683-7830. If you are yearning for a particular variety and don’t see it listed on the order form – give us a call, 360 681-7930 or 360 461-5811, we probably have it or will get it for you. You can also email any questions to info@victorslavender.com. Please be sure to print legibly (fax copies can get a little fuzzy) and include your credit card information (number & expiration date) on the order. Washington State residents please include a copy of your current resale certificate or sales tax must be added to your order. We require a 10% deposit on preseason orders which will be charged to your card at the time of the order. You will not be billed for the balance until your order ships in the spring. We are busy, busy in the greenhouses now getting these little lavender gems off to a good healthy start for your spring planting. 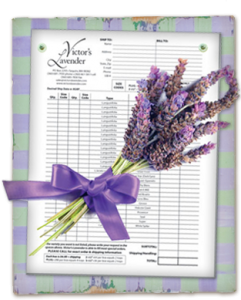 We are looking forward to a great new season next year and hope all of you lavender enthusiasts feel the same. We want to thank all who stopped by to see us during the Lavender Farm Fair this past summer. It was great to see some old familiar faces again and to meet some of you face to face for the first time. This was the first year we had our growing operation open to the public and we had a great time. 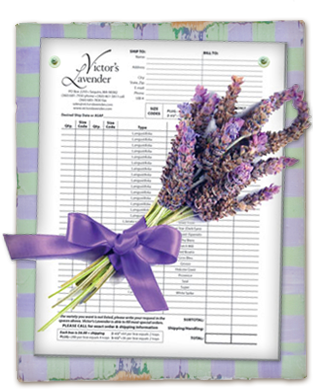 We enjoy showing all of you how and where your lavender plants got their start.